Michael "Butch" McColly Johnson (born May 28, 1954 in Los Angeles) is a former professional American football player who played wide receiver in the National Football League for the Dallas Cowboys (1976–1983) and Denver Broncos (1984–1985). He played college football at the University of California, Riverside and was drafted in the third round (87th overall) of the 1976 NFL Draft. Johnson attended Dorsey High School where he practiced football and track. In 1972 he finished second-place in the pole vault event at the All-City meet. He was a non-scholarship athlete at Division II University of California, Riverside in football and track. He led the nation in receiving in 1975 with 67 catches for 1,027 yards, in just eight games, while earning All-American honors. In 1974 he was second-team for the UPI Little All Coast Football team. The school dropped the football program the year after he graduated. In 2012, he was inducted into the UCR Sports Hall of Fame. The next year he was inducted into the Riverside Sport Hall of Fame. Johnson was selected by the Dallas Cowboys in the 3rd round of the 1976 NFL Draft. In 1978, he tied an NFL record with the most punt returns (9) in a game, while playing against the Buffalo Bills. For a long time he was considered one of the best-backup wide receivers in the NFL, but during his 8 seasons with the Cowboys he could never earn a starter position. As the third receiver during that time, he was primarily known for his acrobatic and clutch receptions. He also became the second leading punt returner in franchise history. He helped the Cowboys win Super Bowl XII with a highlight reel 45 yard touchdown reception from Roger Staubach, which is considered to be a "Super Bowl Classic". In the Dallas Morning News newspaper, after Super Bowl XII, on Monday, January 16, 1978, the front page photo was titled "Outfielder Butch", referring to his diving touchdown catch, as he dove over the Denver Broncos end zone, diagonally, to successfully make the reception. One year later he had another touchdown reception in Super Bowl XIII which the Cowboys lost to the Pittsburgh Steelers, making him the second player in NFL history to score touchdowns in back-to-back Super Bowls. Johnson's touchdown celebration was known as the "California Quake", where he would simulate pulling guns out of holsters and proceed to shoot them and shake. It became one of the most famous individual celebrations in league history, and one of the reasons the NFL banned rehearsed end-zone touchdown celebrations. He proved himself in 1981 when he started the first six games while Tony Hill was injured, he had 25 catches, 552 yards and 5 touchdowns. He also was one of two players in franchise history to rank in the top ten career list in kickoff and punt return average yards. In 1983 he had his best year with 41 receptions and 561 yards, but he had grown tired of his third receiver status and requested a trade. 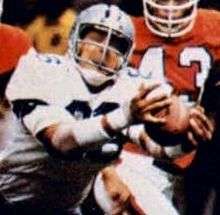 The Cowboys granted his wishes and traded him to the Houston Oilers in exchange for wide receiver Mike Renfro, plus the right to swap second-round picks in the 1984 NFL Draft and the Oilers' fifth-rounder in the 1985 NFL Draft. A year later, the Cowboys used that fifth round pick to select Herschel Walker. Johnson's outrageous personality and flamboyant on-field antics wore thin with the Oilers very quickly, who after just 3 preseason games, traded him to the Denver Broncos for a third round draft choice in the 1985 NFL Draft. In 1984 he had career highs with 9 starts, 42 receptions, 587 yards and 6 touchdowns. The next year an injury slowed his performance and eventually lost his starting job to Vance Johnson. He was waived on August 18, 1986. Johnson played in the NFL for 10 seasons, catching 193 passes for 3,091 yards and 28 touchdowns. He appeared in 5 NFC Championship Games and 2 Super Bowls. He also tied the Super Bowl records for most fumble recoveries in one game and most career fumble recoveries (2). His brother in law is singer-songwriter Bill Withers and former Massachusetts Senator Edward Broke is his second cousin.